Serena Williams, having thrown her dolly out of the pram, abusing the Umpire and breaking her racquet (Shades of John McEnroe there) is having a good whinge about how she is fighting for 'women's rights' and how men have got away with worse. I cannot imagine a worse defence for her conduct. If she is right, then the Umpire's who let men get away with worse should have been disciplined. Fame and achievment should not be used as a 'get out of gaol free' card. Bad behaviour may be very entertaining and make good future material for 'Rude Tube', but there will usually be a price to paid. 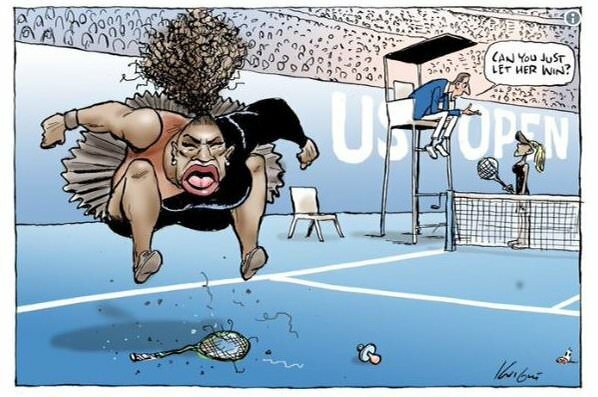 There has been an uproar in the US & here over a satirical cartoon depiction of Serena throwing her tantrum. Of course the racist label has been thrown at the cartoonist & the paper he works for the Herald Sun - who are backing him to the hilt. His wife & children have received death threats morons of the world unite. This is the type of response typical of Islamists not from a Jehovah Witness or disgruntled African Americans. You tell me if this satirically captures what Serena did .... or is it racist? Remembering all satirical/political/sports cartoonists exaggerate the features of their subject regardless of race. Those freedoms are currently heavily threatened if the UK & European(EU) govts keep going down the path they tread. These people are just "Snowflakes."